HERE YOU CAN PURCHASE THE CAT II Q FORESKIN RESTORATION DEVICE, PARTS AND ACCESSORIES. The most advanced method of it's type, yet, the least expensive! I've constructed the CAT to be as compact, as comfortable, as safe and as easy to adjust, as possible. It can be extended about 3" - 4.5" from the compressed point. Before you order, make sure of the correct size needed. The diameter of the regular CAT II Q is 1-3/8" (35mm), the smaller CAT II Q (special order) is 1" (25.4mm) diameter. The best way to determine your needs, is to place a cylinder, of the same diameter, on top of the glans and see, if the skin tube will roll over it. Also, don't order the smaller CAT, if your measurements indicate the regular CAT. To order the 1" version of the CAT II Q, you can email me beforehand, but also, "make note of your preference" during checkout, on the PayPal information form, "note to seller", (if it's available). If you are student and have a .edu or other college associated email address, or you are a U.S. Veteran with proof of service, write to me for further discounts. See below to purchase. Also, some of the packages are available on eBay. Domestic Orders Shipped 1st Class - $4.25 or Priority - $7.50, to be selected at checkout. International Orders Shipped 1st Class - $10.00 - $14.50, or International Priority orders - to $34.50, to be selected at checkout. International buyers are responsible for any customs or other import fees, applied prior to delivery. Has your PayPal address changed? Please be sure, that the address entered for shipping is correct! Orders received before noon, Eastern time, will likely be shipped the same day or next work day. If the desired shipping address is different, than on your credit card account, you might, select the "gift option" on the PayPal checkout, before entering the desired shipping address. Check for new items at bottom of page. CAT II Q - quick tension foreskin restoration aid. Includes: pusher, puller, outer cone, longer rod and metal ring, with International Priority or First Class shipping. "Priority Shipping" has better tracking for remote countries. Please, email me with questions and enter shipping address in English. Note: The "Small outer cone" will not work with the "Regular sized" CAT. Replacement Pusher Soft Silicone Rod attachment is "push fit". A dab of water based lubricant used between glans and pusher, might be beneficial. CATS Currently shipped with this silicone pusher. Plastic Deep Pusher for advanced users, now furnished with a soft plastic insert to allow for a "push-fit" to rod attachment. 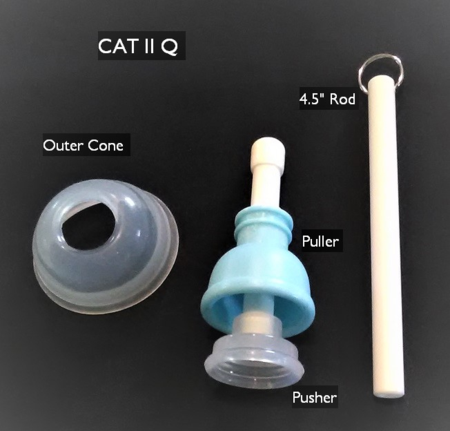 These are designed to be used with the Regular Sized CAT II Q.
Silicone Deep Pusher - softer, more comfortable, deep pusher, which can be trimmed, if needed. For advanced users and others, who might require a custom fit. Rod is a "press fit" into the pusher. These are designed to be used with the Regular Sized CAT II Q. Note: A dab of water based lubricant applied to the deep pusher, is suggested. Replacement Collet (grab/release device) for the CAT II Q. Replacement Tensioner Rod for the CAT II Q, 4.5 inches. 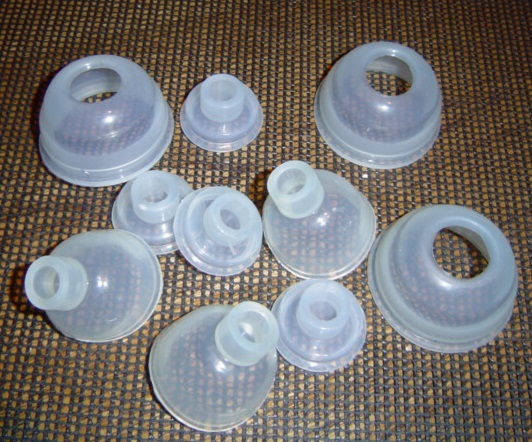 Retainer - can be used with your CAT outer cone or can be purchased with a new CAT outer cone. Outside of retainer just like the CAT puller, however inside is "straight - thru". Can be urinated thru, at your discretion. Can be worn as a starter or just to keep covered. Will not work as a "CAT Puller". Offering, at sale price, CAT regular size (1-3/8"), compatible, silicone "seconds". These parts have probably (1) small defect, such as, a small fleck of charred silicone or a small bubble, molded within. Options include: "outer cone", "regular pusher" and "deep pusher". While supplies last.